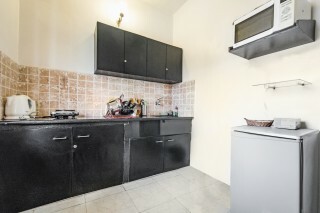 Part of a well-developed property, this is an offering of a one-bedroom apartment that can accommodate up to three guests. 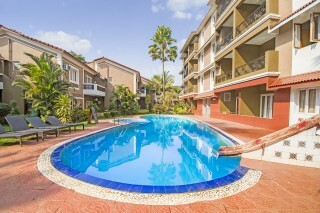 The property features a swimming pool and the apartment has a spacious kitchen, where you can cook comfortably. Ample parking makes parking convenient for those on a road journey. 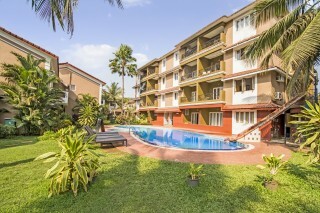 The property is close to popular beaches like Candolim (1.5 km) and Calangute (4.5 km), and is in the vicinity of LPK Waterfront (3 km), a famous nightclub. Your Space The property features a well-tended lawn dotted with towering palm trees and tropical shrubbery. A huge swimming pool adorns the lawn, which beckons you to take a refreshing dip. 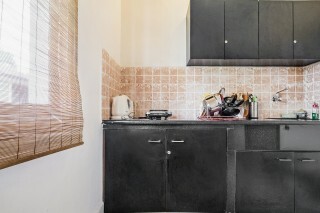 The apartment has a fully functional kitchen, equipped with a microwave, a refrigerator, an electric kettle, a toaster, basic utensils, and an induction cook-top to take care of all your culinary needs. Two water bottles will be provided daily for your convenience. 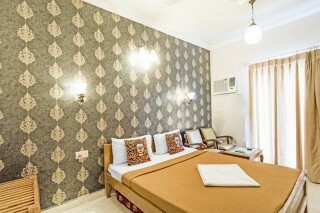 The air-conditioned room on offer boasts an accent wall which accentuates the contemporary vibe of the accommodation. It is handsomely furnished with a plush double bed, along with wall-mounted lights to ensure that you can read well into the night. A plush couch, a compact wardrobe, and a utility table are also present for added convenience. A TV is provided, ensuring that you do not miss out on your favourite TV shows even while on a vacation. The bedroom opens out to a balcony which provides a delightful view of the pool and the adjoining area and makes for the perfect place to enjoy a cold beverage on a sunny day. The en suite bathroom is well appointed with western sanitary ware. Guest Access: Feel free to spend leisurely time in the common area of the property, the pool, the restaurant, and the kids' play area when you are not in your apartment. There is ample parking space and a shared gym. Guest Interaction: Feel free to reach out to the caretaker in case you need any assistance. I'm available over the phone and local help is provided on request. 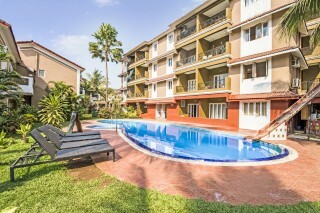 Neighbourhood Overview: The property is 1.5 km from Candolim Beach, 4.7 from Calangute Beach, and 6.6 km from Baga Beach. LPK Waterfront is just 3 km away, and Club Cabana is 6.9 km away. 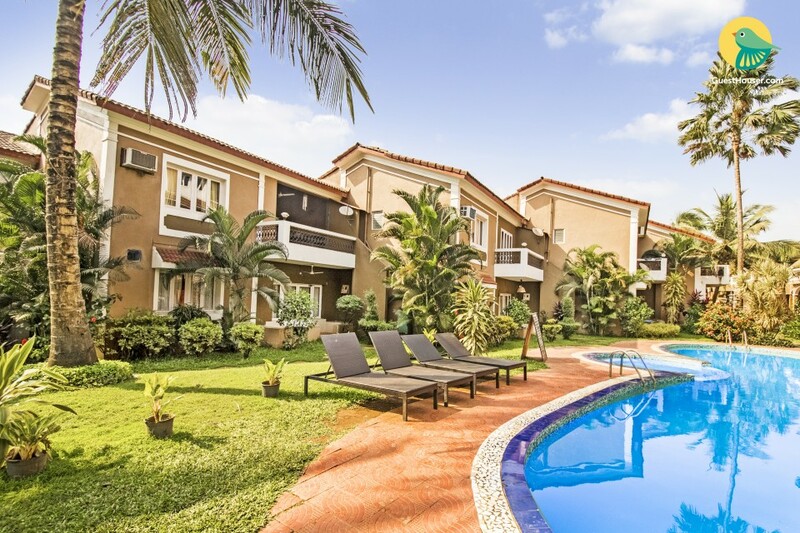 Getting Around: The nearest airport is Goa International Airport which is 37.5 km from the property. Thivim Railway Station is 21 km away, and Mapusa Bus Station is 10.4 km away. Additional Information Guests are requested to provide valid ID proof at the time of check-in. We provide a pickup and drop facility on request. Guests can access the swimming pool between 8 am and 6 pm. All meals are provided on chargeable basis. Please refrain from playing loud music. We do not host groups of male bachelors. We regret any inconvenience this may cause. THANK YOU guesthouser for Giving a wonderful experience. The staff is very attentive. The location and views are unparalleled!. We had a fantastic stay at this property! the service and cleaning was outstanding. A lovely hotel set away from the hustle and bustle making it perfect to relax and chill out.. I have to say that I enjoyed my stay to the fullest. I feel like home. Thanks to owners. Totally recommendable. I stayed here with my friends. Nice room, Great ambience, close to beach , pool and restaurant in the campus. Loved it.